By 1700 Thomas Newcomen had an established ironmongery business in Dartmouth in Devon, where he was in partnership with plumber and glazier John Calley. After his father died in 1702, he borrowed money from Sarah Dottin and Charles Trengove (a relative) to finance the business. The Dottin family owned several properties in Dartmouth, including the house next door to Calley. It seems Newcomen borrowed several sums of up to £40, at intervals from 1702 until about 1718. Problems would arise later when there was a dispute over repayment receipts. His borrowing indicates that he was not a wealthy man and that he must have worked hard to pay for the experiments with steam power. It was probably soon after his father's death that he met Hannah Waymouth (1682-1756). They married on 11th September 1705 at South Huish in Devon. Newcomen was 41 years old and his bride just 23. She was the daughter of Peter Waymouth (1660-1751), a farmer at Malborough near Kingsbridge, South Hams (Devon). The couple had three children — Elias (1706-65), Thomas (1708-67) and Hannah (1710-1805). Elias followed in his father's footsteps and became an ironmonger. The profession at that time implied proficiency in working with all kinds of metals, including tin, copper, brass, lead and iron. 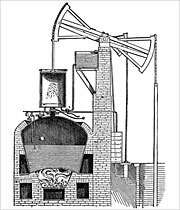 Though little is known of Newcomen's transition from ironmonger to steam engine maker, it is possible he was aware of the work of his contemporaries — though there's no basis for the often-repeated theory that Robert Hooke (1635-1708) informed Newcomen of Denis Papin's (1647-c.1712) work and suggested the direction for experiments. In the period 1690-95, Denis Papin had combined atmospheric pressure and a vacuum to demonstrate motive power. He placed a close-fitting piston into a cylinder, connected to a weight by a cord and pulley. As the piston was raised, the cylinder filled with steam. As the steam cooled, it condensed, producing a vacuum, and atmospheric pressure drove the piston down, lifting the weight. However, it's far more likely that Newcomen and Thomas Savery (c.1650-1715) were known to one another. Records show that both visited the mayor of Dartmouth (Caleb Rockett) regularly between 1706/7 and 1712/3. Savery had been also born in Devon, at Shilstone manor house near Modbury. He was probably a military engineer, well educated and well connected, who spent his spare time inventing various machines. He patented two in 1696 and he found favour with the king, William III. He then turned his attention to solving the challenge of extracting water from flooded mines by inventing a steam-driven pump. His pump was patented (No.356) on 25th July 1698 and the title page of the patent reads, "A grant to Thomas Savery of the sole exercise of a new invention by him invented, for raising of water, and occasioning motion to all sorts of mill works, by the important force of fire, which will be of great use for draining mines, serving towns with water, and for the working of all sorts of mills, when they have not the benefit of water nor constant winds; to hold for 14 years; with usual clauses". The patent included no construction details but because it mentioned raising water (pumping) using the force of fire (heat to produce steam), it was deemed to cover all subsequent steam engines. Ironically, Savery's device had no moving parts and so wasn't really an engine. He too used the condensing of steam to create a vacuum, causing water to be sucked upwards. On 25th April 1699, Savery's patent was extended a further 21 years, to 1733. In 1702, he published The Miners Friend, Or An Engine To Raise Water By Fire, which describes the many uses he anticipated for the invention. Though little is known of Newcomen's activities before about 1711 (when he was 47 years old), he must have been experimenting with steam long before that date. Several documents written by people who knew him confirm this supposition. Horticulturalist Stephen Switzer (1682-1745) writes, "I am well informed that Mr Newcomen was as early in his invention as Savery was in his, only the latter being nearer the Court had obtained his patent before the other knew it; on which account Mr Newcomen was glad to come in as a partner to it". The quote is from Switzer's 1729 publication An Introduction to a General System of Hydrostaticks and Hydraulicks, Philosophical and Practical. This dates Newcomen's work to before 25th July 1698 — the date of Savery's patent. Dr John Allen (1660-1741), writing in 1730, the year after Newcomen's death, says of him, "It is now more than thirty years since the engine for raising water by fire was first invented by the famous Captain Savery, and upwards of twenty years that it received its great improvement by my good friend, the ever-memorable Mr. Newcomen, whose death I very much regret". In Stockholm in 1734, Swedish engineer Marten Triewald (1691-1747) published A Short Description of The Fire and Air Machine at The Dannemora Mines (not available in English until 1928). After describing Savery's work and the extension of his patent, he states that "... a man from Dartmouth, named Thomas Newcomen, without any knowledge whatever of the speculations of Captain Savery, had at the same time also made up his mind, in conjunction with his assistant, a plumber by the name of Calley, to invent a fire-machine for drawing water from the mines. He was induced to undertake this by considering the heavy costs of lifting water by means of horses which Mr. Newcomen found existing in the English tin-mines. These mines Mr. Newcomen often visited in the capacity of a dealer in iron tools, with which he used to furnish many of the tin-mines. For ten consecutive years [1698-1708] Mr. Newcomen worked at this fire-machine�. The implication is that Newcomen was working on steam engines for some 14 years before 1712, the date of the completed engine now considered to be his first. The early experiments may have been hampered by the limitations of components available at the time and the difficulty of achieving precision results. Whatever way his work with steam engines started, Newcomen now embarked on the most productive period of his life. He would design and build the engines that enabled the transformation of the basis of European working practices from manual labour to mechanisation. A sketch of the gabled house in Lower Street, Dartmouth , where Newcomen resided. The house was taken down by the authorities in 1864, and parts of the structure were purchsed by Mr Thomas Lidstone — a Newcomen enthusiast — who built them into his new house, which he named Newcomen Cottage.